Adam Turl is an artist and writer from southern Illinois (by way of upstate New York, Wisconsin, Chicago and St. Louis) living in Las Vegas, Nevada. He is the art and design editor at Red Wedge and an adjunct instructor at the University of Nevada - Las Vegas. Turl’s most recent exhibitions include Revolt of the Swivel Chairs at the Cube Gallery (Las Vegas 2018), The Barista Who Disappeared at Arspace 304 (Carbondale, IL 2018), and The Barista Who Could See the Future at Gallery 210 as part of Exposure 19 (St. Louis, MO 2017). In 2016 he was in residency at the Cité internationale des arts in Paris. His Instagram is adamturl_art. Tish Markley is a writer and poet from Central Illinois living in Las Vegas, Nevada. Growing up they had a pet cow named Bob – named after an auctioneer at the sale barn. Markley beat up homophobes in high school. They literally once owned a pair of rose-colored glasses but lost them. Working on The Last Barista (Revolt of the Swivel Chairs) in Las Vegas studio (January 2018). 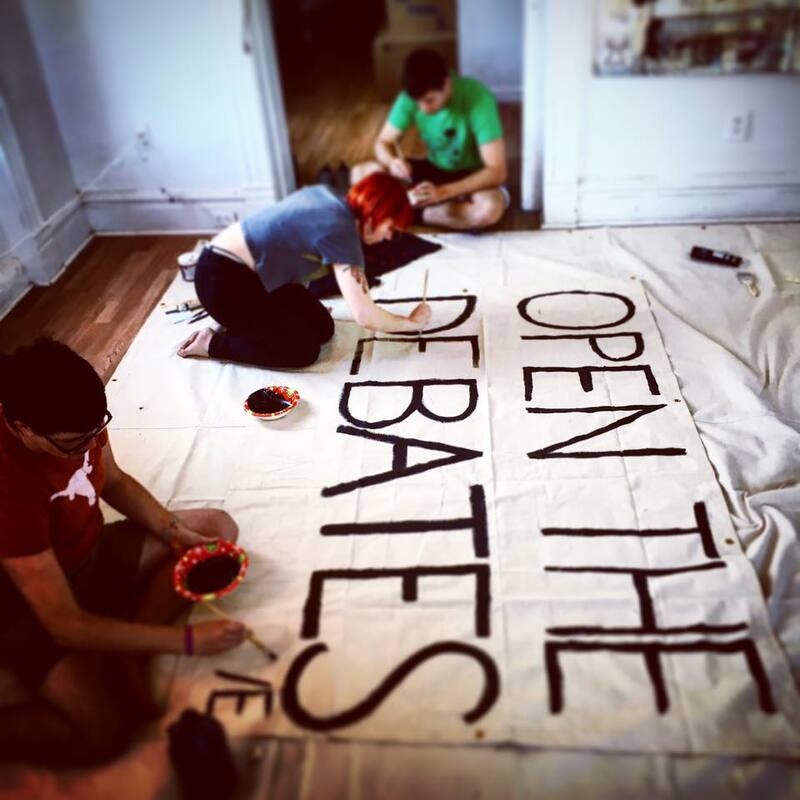 Banner making at the Dollar Art House (2016). "Preview Thursday" for Revolt of the Swivel Chairs at the Las Vegas Cube Gallery (2018). Hard Times Art Show II with Richard Reilly, Sarah Hermes Griesbach, Buzz Spector, at the Dollar Art House (2016). "First Friday" for The Barista Who Disappeared at Artspace 304 (Carbondale, Illinois) (Summer 2018). "First Friday" for Revolt of the Swivel Chairs at the Las Vegas Cube Gallery (2018). Artist talk at the opening of The Barista Who Disappeared at Artspace 304 (Carbondale, Illinois) (Summer 2018). Working on The Beggar Queen (Revolt of the Swivel Chairs) in Las Vegas studio (Fall 2017). Adam Turl, Alexander Billet and Crystal Stella Becerril at Historical Materialism London (2016).